Carefree Flat is a premium plus 100% acrylic interior/exteior matte flat finish which provides superior washability and scrubbability. This premium flat exhibits excellent stain and dirt resistance, burnish resistance, hide, color retention and adhesion. Use of Carefree Flat resolves the problem of scuffing and burnishing, particularly in dark colors. 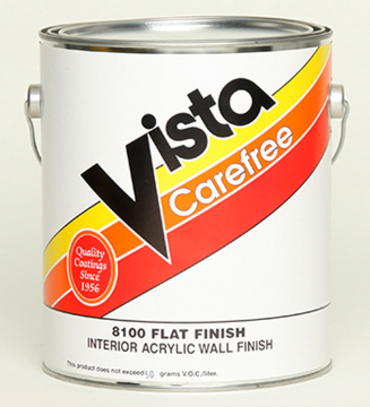 Carefree Flat can be applied over new or previously painted drywall, plaster, stucco and wood. Carefree Flat has excellent application properties and spatter resistance. Excellent for use on commercial, residential, institutional or custom painting interior and exterior projects. NOTE: This product contains ingredients which resist the growth of mircrobes on the surface of the paint film. Recommended Uses: Properly primed interior/exterior drywall, plaster, concrete, masonry, wood and metal. Colors: White, stock colors and custom colors to order.